Blueprint Gaming has done it again with yet another amazing Megaways slot release. Megaways Wolf Legend is an action-packed slot that offers up all sorts of great bonuses including free spins, increasing multipliers, mystery symbols and more - along with an impressive top prize worth 50x in a high volatility format. The RTP of this slot is 96.50%. Read our full review below. Megaways Wold Legend is set in the desert with an eye-catching theme that features a background depicting interesting rock formations and cactuses against a beautiful backdrop. Symbols include all sorts of desert animals like eagles, buffalo, cougars and, of course, wolves. In fact, the slot actually looks a bit like Megaways Buffalo Rising , so if you were a fan of that Blueprint slot, then you’ll be inclined to give this one a spin as well. In Megaways Wolf Legend from Blueprint, you can trigger up to 117 649 ways to win on each spin. This is because each reel can contain between 2 and 7 symbols; the more symbols that land on the reels, the more winning ways you have. The bet range here is pretty vast, as well, offering players wagers between just .10 coins and 10 coins per spin, which makes this game perfect for players with smaller budgets. What is the RTP of Megaways Wolf Legend Slot? The RTP (return to player) or Megaways Wolf Legend from Blueprint Gaming is 96.50%. It is also a high variance online slot, which means that you’re in for some very generous prizes as you spin the reels. However, this level of volatility also means that your prizes will come around less often than they would in a low or medium variance slot. When you land three or more matching symbols on adjacent paylines, then you’ll hit a winning combination. The top prize available is worth 50x your stake, when 6 golden wolf symbols appear across the reels. Whenever you win, a cascade occurs and you’ll have the chance to hit more prizes. The regular wolf symbol is the wild; it doesn’t pay out its own prizes and only acts as a substitution. Mystery symbols are present during the base game and free spins round. Whenever a landscape symbols appears, it can transform into any other symbol except the scatter. When you land three bonus symbols (or wager 75x your stake on the Bonus Bet), you’ll be taken to the Golden Streak feature. To begin with, you have 3 lives (the number of free spins you’ll receive) and you have the chance to add more. In this round, only scatters appear on the reels and, for every scatter that lands, you’ll receive between 1 and 5 extra free spins. The round ends when a spin occurs with no extra scatters. Then, you’re taken to a gamble feature. In this wheel-based round, you can either choose to collect the number of free spins you’ve accrued or spin the wheel to double it. If you’re super unlucky, then you’ll forfeit the free spins round altogether – so, be careful. Once you’ve in the free spins bonus, increase multipliers are present. Whenever you hit a win, whether it is part of a cascade or its own payout, your multiplier will increase. There is no limit to how high your multiplier can climb. You can play the Megaways Wolf Legend slot demo here at Slots Temple. You’re given 1000 free-play credits to spend as you wish, making this the perfect time to determine whether or not this is the kind of game that you’d like to wager real cash on. We always recommend playing between 150 and 200 spins to give you a good idea. 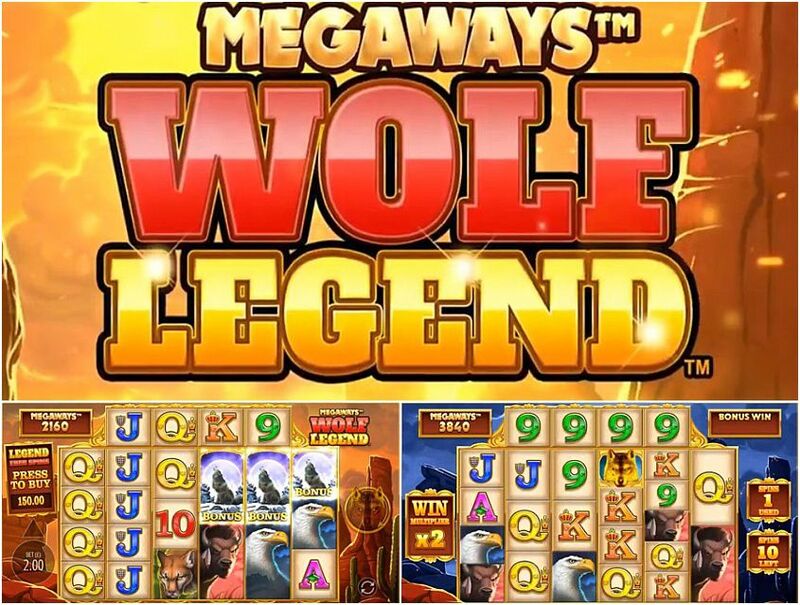 Megaways Wolf Legend is an online slot that you can play on your tablet, smartphone or PC. This slot looks great and runs well no matter how you choose to play. Whether you’re spinning the reels on a smaller screen or larger screen, this slot looks fantastic and you won’t miss out on any gameplay details. Megaways Wolf Legend is a fantastic addition to Blueprint Gaming’s catalogue. The game features impressive graphics and a whole host of bonus features that players are sure to enjoy. Our only gripe is that it seems a little bit too similar to Megaways Buffalo Rising in terms of aesthetics, but it’s still a fun game in its own right. The multi-level bonus game really ramps up the excitement as you spin the reels on Megaways Wolf Legend, and we appreciate that you can bypass landing scatters by using the Bonus Bet. This game is definitely a great choice for players who are looking for a thrilling online slots experience. Can I play Megaways Wolf Legend slots for free? You can play Wolf Legend Megaways as a demo slot here at Slots Temple. You don’t have to make any deposits or register to any online casinos. Does Megaways Wolf Legend slot have free spins? You can trigger the free spins bonus in Megaways Wolf Legend by landing scatters or using the Bonus Bet and wagering 75x your stake. Can I win real money playing Megaways Wolf Legend slots? If you’d like to vie for the chance to win real prizes on this slot, visit a Blueprint-powered online casino like Videoslots . Can I play Megaways Wolf Legend slots with no deposit? To play Megaways Wolf Legend as a no deposit slot, you can play the game demo here at Slots Temple. However, keep in mind that you’re just playing for play-money prizes. Can I download Megaways Wolf Legend slots? There’s no need to download any software to play Megaways Wolf Legend. * Megaways Wolf Legend trademark / license is owned by Blueprint Gaming. This site is not endorsed by Blueprint Gaming.